1.Heat ½ C ghee, add the rava (semolina) stir fry on low heat till it turns golden brown in color and aromatic. Remove from heat. 2. Heat 1 tbsp of ghee and stir fry the cashews till golden brown. Keep aside.With the remaining ghee left in the pan, fry the raisins till they swell up. 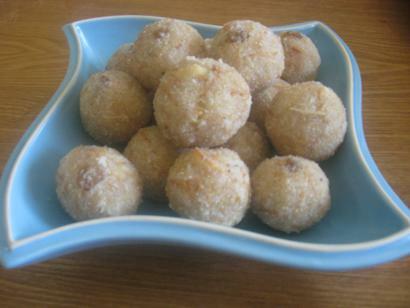 Take out from heat and mix together the fried rava (semolina), cashews & raisins. 3.Grind the sugar to fine powder. 4. Add powdered sugar and cardamom to the rava (semolina) mixture. Combine well. 5. When easy enough to handle, divide the mixture into 12 parts and roll them into balls. If the mixture is little dry to make balls, add some ghee. Leave to cool so that they firm up.